The Pulse Dance Company performed at UDance as a morale boost for dancers (Elissa Borden/Amherst Wire). AMHERST — Fundraising for a charity or an organization is not easy. Raising money takes an incredible amount of dedication, organization and coordination among everyone involved. For the University of Massachusetts Amherst club “UMass For The Kids,” raising money takes a different kind of coordination. 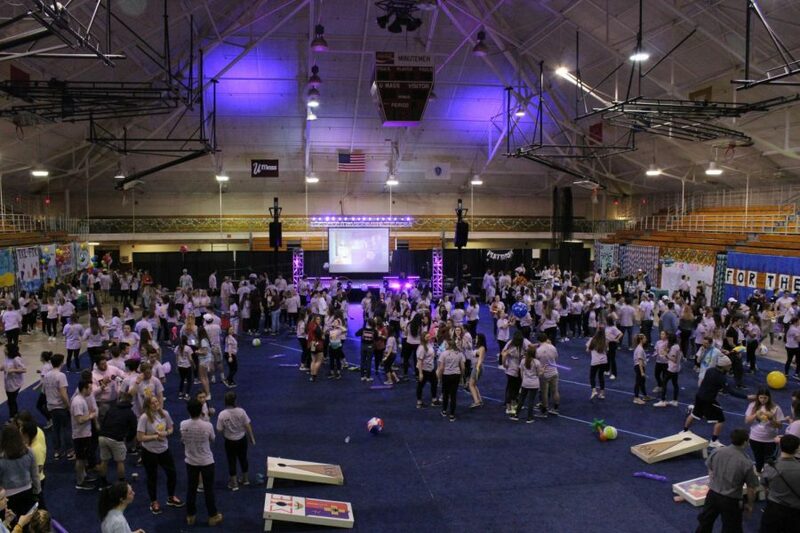 UMass FTK hosted their annual Dance Marathon Saturday at the Curry Hicks Cage, a 12-hour dance event that culminates a year-long effort to raise money for Baystate Children’s Hospital. Not only was the club able to surpass last year’s total of $133,000 raised, they beat this year’s goal of $200,000 by raising a total of $212,134.97 — surpassing their goal by more than $12,000. 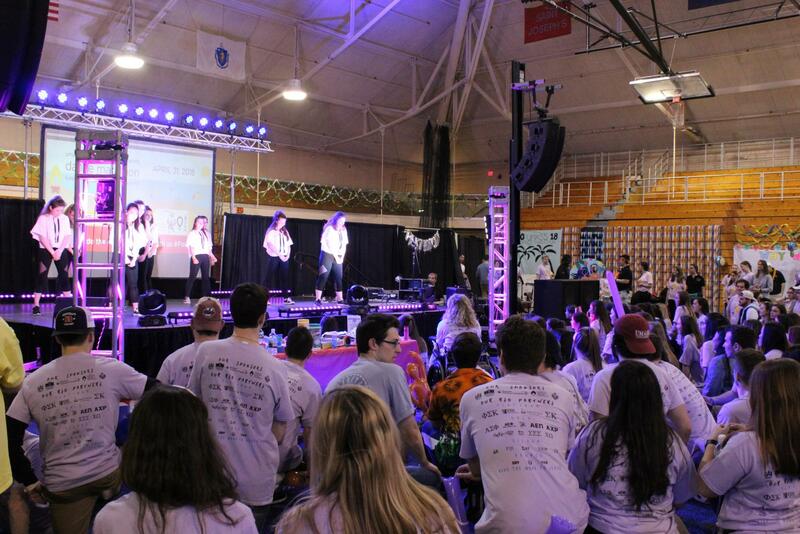 The FTK UDance Marathon was held at the Curry Hicks Cage on Saturday afternoon. (Elissa Borden/Amherst Wire). Baystate Children’s Hospital, located in Springfield, is completely donor-funded and receives no money from the state government. These fundraisers, Liu said, are critical to the financial support the hospital needs to stay afloat. From 10 a.m. to 10 p.m., the entirety of the cage was filled with supporters ranging from UMass Greek life to community members that wanted to take part in the fundraising effort. Music blasted from a stage located in the center of the floor, and dancers gracefully executed their moves around balloons and streamers. Any club on campus can participate, but every Greek life organization on campus sets their own minimum to raise for the event. Even more than that, every sorority and fraternity coordinates a team of dancers to go up on stage and dance during the marathon. Mark Schmidt, the team captain for the Phi Sigma Kappa fraternity’s dance team and UMass senior studying corporate finance, said that his fraternity raised about $9,500 by the time the Amherst Wire spoke with him. Schmidt was sure that his fraternity would easily raise more than $10,000 since the fraternity had raised $2,000 from events that would be added on top. Some Greek life organizations get a “miracle child” who was treated at Baystate Hospital at one point. For Phi Sigma Kappa, they sponsored Shane Perry, an eight-year-old boy who was diagnosed with down syndrome. With some of their money, the brothers were able to buy Shane a treasure chest with $300 worth of toys. Members of the UMass Mens Club Hockey team were at UDance raising money for the Baystate Children’s Hospital, offering dancers an opportunity to take a shot at the little goals seen here. (Elissa Borden/Amherst Wire). Jessica Perry, Shane’s mother, was at the event with her son and said she was so grateful for all of the support she had seen from Phi Sigma Kappa and UMass FTK. She said her son had been in and out of the hospital more than seven times, and that Baystate had saved Shane’s life twice. 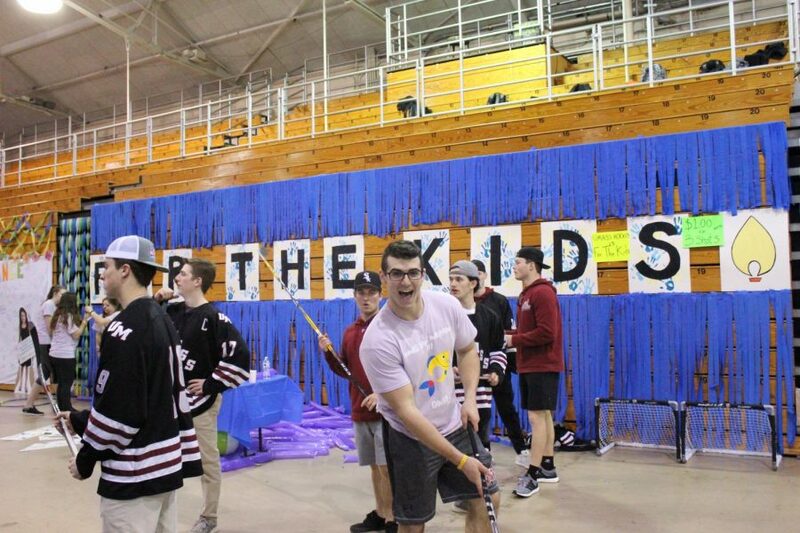 Brady Sharon, a UMass senior economics major, is vice president of external relations for UMass FTK, and says that overall, the main goal for the event is to stay true to the organization’s namesake — to fundraise for the kids. Email Michael Connors at [email protected] or follow him on Twitter @mconnors_j.